Jake Fraley hit his second home run of the season Thursday. 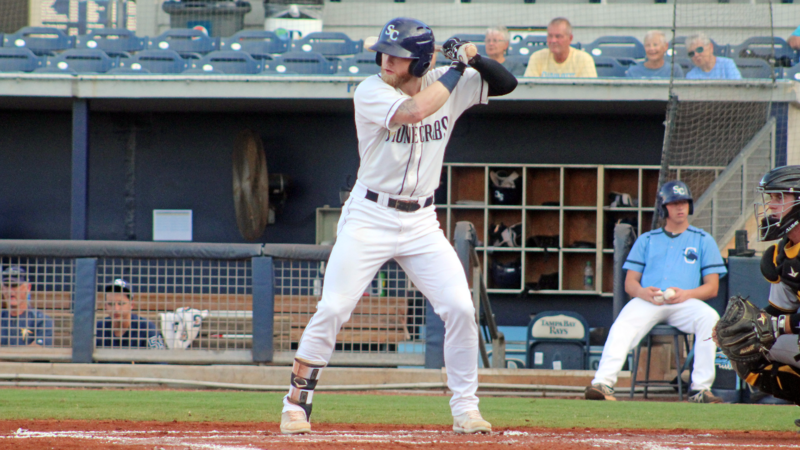 BRADENTON, Fla. (August 23, 2018) - The Charlotte Stone Crabs used three home runs to power past the Bradenton Marauders 7-5 Thursday at LECOM Park. All nine Stone Crabs (69-56, 35-23) recorded base hits by the fifth inning. With their three home runs, Charlotte broke the franchise record for dingers in a season, surpassing the 2013 team which hit 76. The Stone Crabs did not waste any time taking advantage of the conditions at LECOM Park. With two outs in the top of the first, Carl Chester and Jake Fraley cranked back-to-back solo home runs to give Charlotte a 2-0 lead. After a Hunter Owen home run made it 2-1, Vidal Brujan doubled to begin the top of the third. After a walk, Chester pulled an RBI single to left to score Brujan and make it 3-1. With the score the same in the top of the fourth, Eleardo Cabrera lined a two-out single to right. The next batter was Jermaine Palacios , who pulled a two-run home run to left to extend the Charlotte lead to 5-1. Still up four in the top of the fifth, Brendan McKay led off the inning with a double to the wall in right center. After Chester singled him to third, Fraley pulled a sacrifice fly to right to make it 6-1. After another hit, Kevin Padlo scorched a run-scoring double down the left field line to cap the inning at 7-1 Charlotte. Bradenton added another run on a double play in the sixth. Down 7-2 in the bottom of the seventh, they strung together four straight two-out singles to cut the deficit to 7-4. After the Marauders tacked on a run in the eighth to make it 7-5, Ivan Pelaez left the bases loaded, pitching the final 1.1 frames to get the save. Stone Crabs starter Josh Fleming (3-2) went 6.2 innings to earn the win, allowing four runs on eight hits while striking out four. The Stone Crabs will open a three-game series with the Clearwater Threshers at 6:15 p.m. on Friday. Brandon Lawson (2-5, 4.78) makes the start for Charlotte against Alejandro Requena (3-4, 3.98) of the Threshers. Coverage begins at 6 p.m. on the Stone Crabs Baseball Network.